Today when the competition, technology, and the economy are evolving faster than ever before, organizations and the people like us who work in them need a proven approach to help us adapt-and succeed. The key, according to Paul B. Brown, is to think like an entrepreneur, no matter what your position or industry. What works for the most successful entrepreneurs will work for us, Brown argues, whether we want to stay employed working for someone else or are thinking of going off on our own. Based on extensive research, Entrepreneurship for the Rest of Us reveals the best practices of the most successful entrepreneurs, those who are adept at continually innovating and seeing opportunity where others do not. They never start with a new idea, but by trying to solve a market need. Financing is an afterthought. They get started with the resources at hand (not only does that allow them to move quickly, if things don't work out, they are not out much).Perfect is the enemy of good, it is much more important to get out into the marketplace with a prototype than to keep fiddling with what you have. 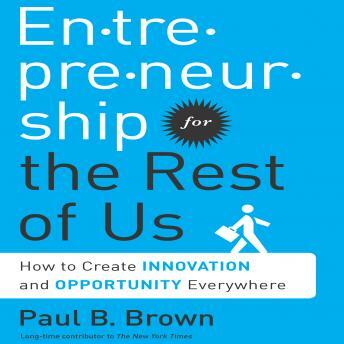 In short, the entrepreneurial mindset is a protection against economic uncertainty, and Brown's goal is to spread that thinking to individuals and large organizations alike. Though of course we won't all start or run our own companies, we need to learn to think like entrepreneurs so that when uncertainty hits, as it will again and again, individuals and companies will be better prepared to not only survive but win.